Foothills, montane, subalpine. Rocky areas. Summer. Above and left: West Fork of the Cimarron Trail, Uncompahgre Wilderness, August 22, 2004. 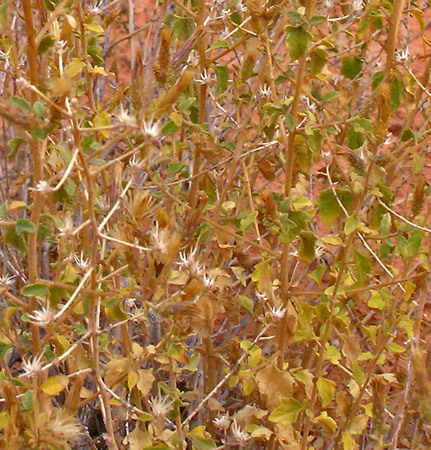 The toothed, triangular leaves and large, rayless, drooping, white/cream/yellow/green flowers of Brickellbush are distinctive. 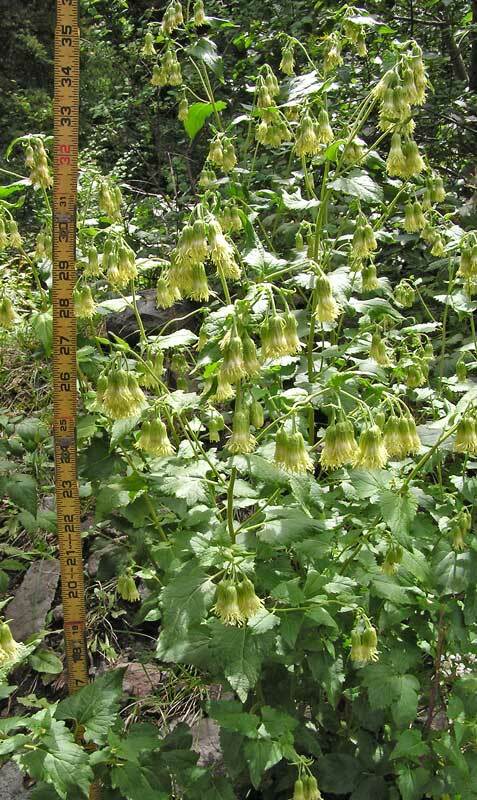 Brickellbush grows from under a foot tall to over three feet tall and several feet wide with flowers up to two inches long. 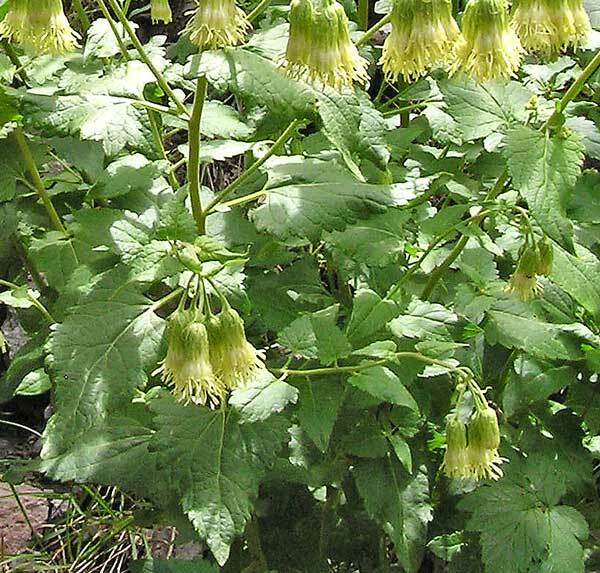 Although Brickellia grandiflora is fairly common, it is frequently overlooked -- even after you get to know it. I often find it, not by seeing the plant first, but by becoming aware that I am in its preferred rocky habitat and then looking for it. Sure enough, I am often standing quite near a Brickellia grandiflora -- and there are usually a number more quite nearby. 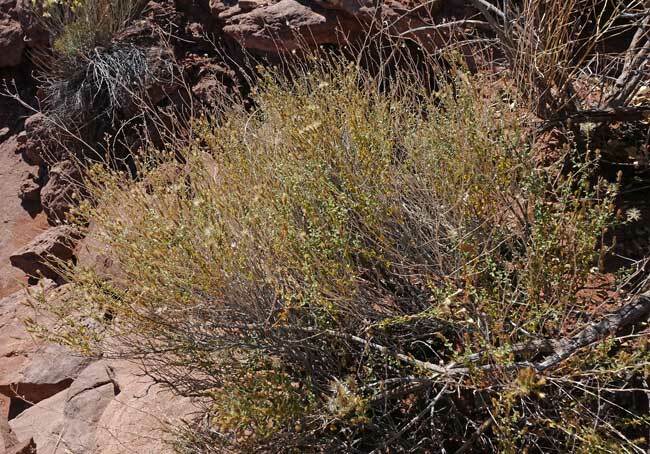 Brickellia grandiflora might be mistaken for Ageratina herbacea, especially because of their shared preference for rocky habitats, their triangular-shaped leaves, and their relatively similar-looking flower heads. Click to read about the differences in the two species. West Fork of the Cimarron Trail, Uncompahgre Wilderness, August 22, 2004. 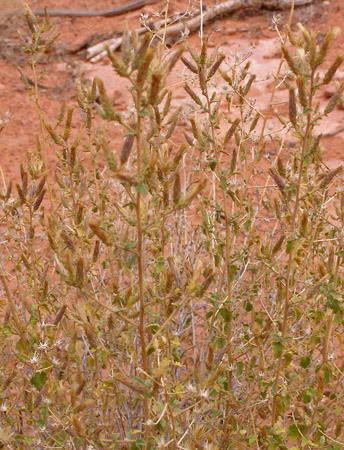 Leaves of Brickellia grandiflora are numerous and range from 1.5 to 11 cm long and .6 to 6.5 cm wide, considerably larger than those of B. microphylla pictured below. Veins can be prominent, as shown here, or more subdued. Leaf margins are always indented with either rolling scalloped edges (crenate) or more sharply serrate or dentate edges. Canyons of the Ancients National Monument, November 12, 2013. In late autumn, Brickellia grandiflora sports numerous 4-5 mm dark seeds ready to be carried on the winds by their white pappus hairs. Semi-desert. 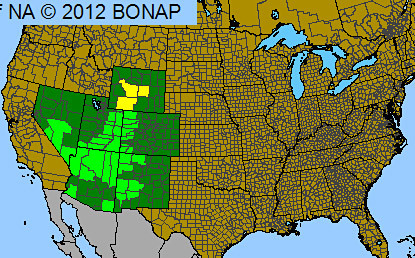 Sandy, rocky areas, woodlands. Summer. Lower Butler Wash, Utah, October 18, 2009. 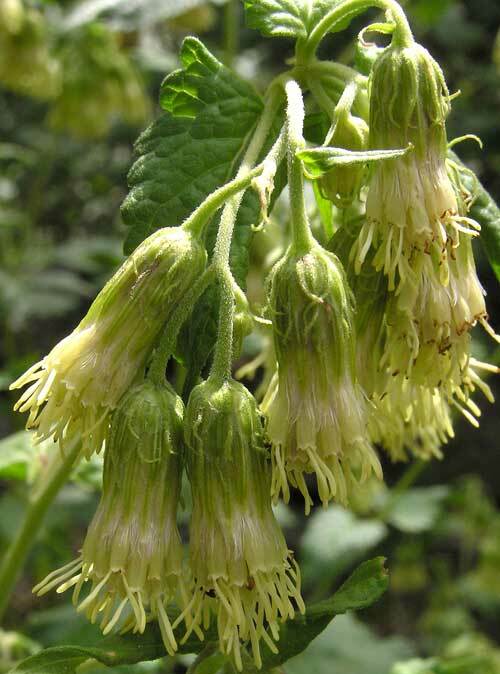 Brickellia microphylla grows to more than two feet tall (as pictured here) with woody stems and masses of small flowers heads, each containing 8-18 disk flowers in a tight, vertical cluster. Leaves are oval-to-round-to-heart-shaped and are considerably smaller (only 3-18 mm long and 1-9 mm wide) than those of B. grandiflora. Leaves pictured here are no more than 9 mm long and 5 mm wide. Thomas Nuttall discovered this plant for science in the mid-1830s and named it Bulbostylis microphylla. 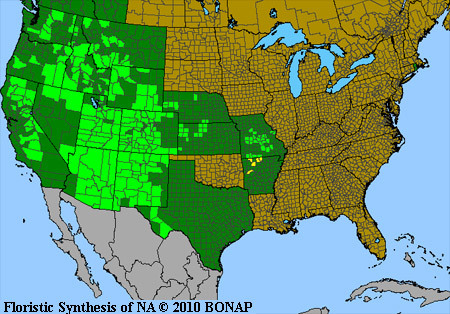 Asa Gray renamed the species Brickellia microphylla in 1852 and then renamed it B. microphylla variety scabra in 1876. The three photographs of B. microphylla shown on this page were taken in the early fall when flowers were long gone and the plants were yellowing and drying. 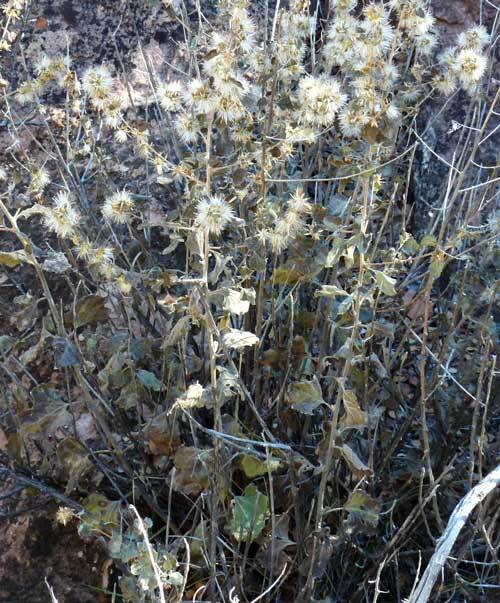 This year's seed heads are brown; last year's seeds have dropped off and only the white star-burst of the phyllaries surrounding the receptacle remain. Leaves are small, numerous, heart-shaped, often with a few small teeth, and the leaves are rough ("scabrous"), the roughness resulting from stiff, pustulate hairs and (sometimes) greatly raised venation.